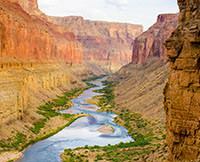 I just returned from a Western River six day Grand Canyon trip on the Colorado River. Everything about our adventure was first rate. Beginning with the reservation agents, to those who advised us on preparations to our guides, we loved every step. Our guides (Evan, Kurt, Wylie and Stephen...I hope I spelled your names correctly) were fun, friendly, entertaining and supremely competent. They were even excellent chefs. We had the time of our lives and would recommend this trip to anyone who wants a little adventure in one of the most beautiful places on our planet.